The Tone effect allows you to add a dark-coloured region to your drawing and simulate the shaded area away from a light source. To produce the tone effect, create a drawing to control where the tone will appear. The Tone effect uses a matte to determine the shape and position of the tone on your drawing and can be blurred at the edges to create a softer effect. NOTETo learn more about using the Tone node, see Adding a Shadow to a Drawing. 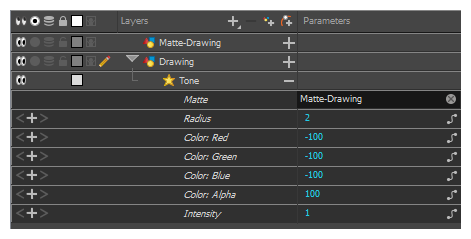 The Tone effect layer must be connected as a child of the drawing layer or group which you want it to affect, and must have a matte drawing layer or group added to its Matte attribute. The part of its parent image that are covered by the matte drawing will have a tone applied to it. Allows you to enable or disable the layer. When disabled, a layer has no visible effect on the rendered image, nor on the preview in the Camera, Perspective, Side and Top views. Sets the colour of the layer in the Timeline view. Name Allows you to enter a name for the node. Activated by default, this option readjusts the blur when the elements undergo a change of depth or scale. When disabled, the effect's values will remain unchanged regardless of depth or scale changes. It is recommended that this option be disabled when multiple drawings are composited and attached this effect. Radial: The edges of the matte are blurred evenly around points that make up the edge of the matte. Directional: The matte is blurred in the direction configured with the Directional Angle and Directional Falloff Rate parameters. Enter a value for the size of the blur. The larger the value, the greater the blur effect. The blur radius is affected by the drawing scale and camera position. 0: Blurs the image to the west. 90: Blurs the image to the south. 180: Blurs the image to the east. 270: Blurs the image to the north. 0: Makes the blur fade out slowly, distributing the blur evenly from the edge of the character to the farthest edge of the blur. 1: Makes the blur fade out quickly. The blur is heaviest closer to the edge of the image. Multiplies the colours of the effect with the colours of the source image. This intensifies the effect. The amount of red to subtract from the colour of the source image. To obtain a shadow effect, the value must be negative. The amount of green to subtract from the colour of the source image. To obtain a shadow effect, the value must be negative. The amount of blue to subtract from the colour of the source image. To obtain a shadow effect, the value must be negative. Alpha The alpha value of the effect. Opens the Colour Picker dialog, in which you can visually select a colour for the effect. Allows you to set the factor by which to multiply the intensity of the effect. This parameter can take a decimal value between 0 and 1. At 1, the effect is fully applied. At 0, the effect is not visible. Inverts the matte used to generate the effect. By default, the affect is applied to opaque areas of the matte and transparent areas of the matte are ignored. When this option is enabled, the effect is applied to transparent areas of the matte and opaque areas of the matte are ignored. Instead of using the colour in the Colour parameters, this uses the colours in the matte drawing to generate the effect. 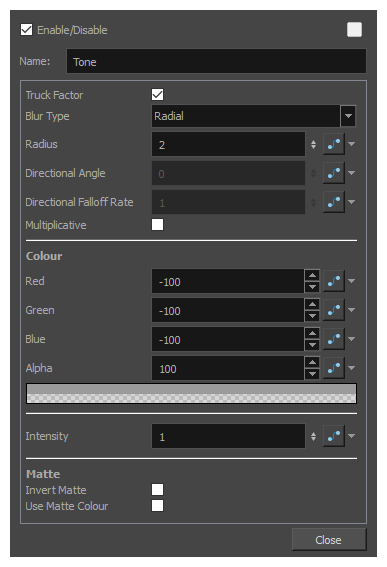 NOTEThe effect of this parameter is only visible in Render View mode.